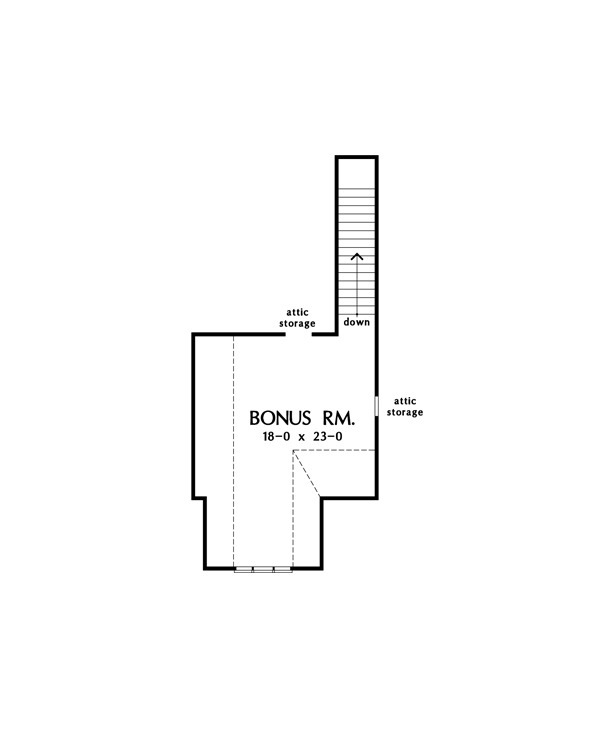 Perfect for long, narrow lots, the Dupree includes all of the amenities of a much larger home. 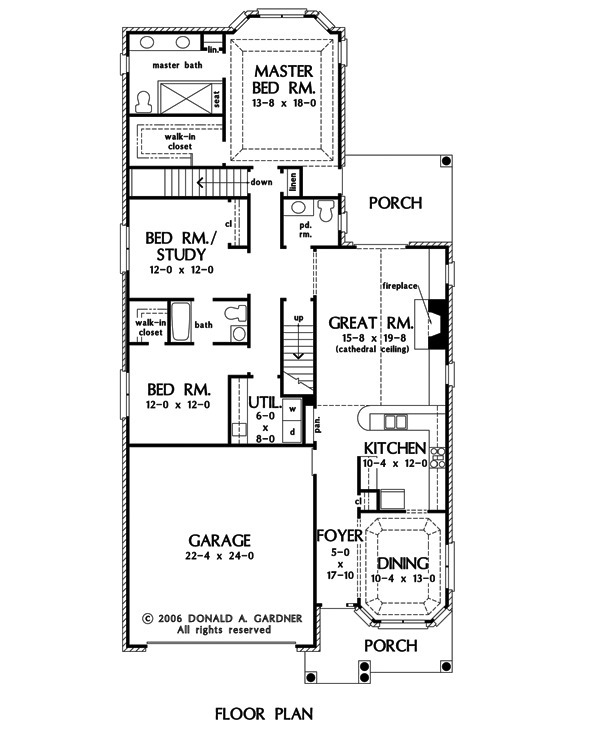 From the charming exterior and front-entry garage, to the custom details, this plan has it all. The foyer welcomes guests in an attractive manner, while the dining room is a perfect example of the luxury to come with its tray ceiling. Next is the kitchen and great room, which are completely open to one another. Countertop space is ample, and the great room's fireplace, porch access and cathedral ceiling provide ultimate elegance. Located in the rear of the home, the master suite is completely private. It's tray ceiling and bay window grant serenity to the bedroom, while a luxurious master bath is every homeowner's dream. 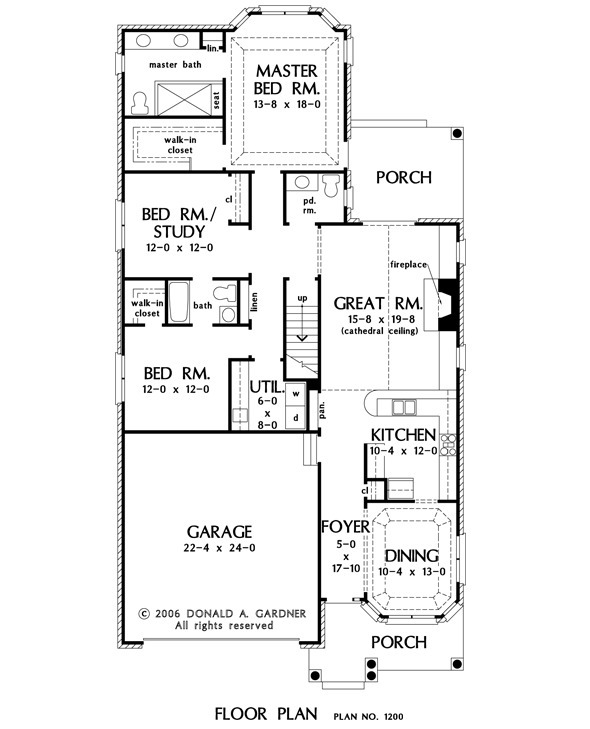 Two secondary bedrooms complete the home and one also has a walk-in closet. Porch - Front: 119 Sq. Ft.
House Dimensions: 39' 11" x 77' 10"
Foyer : 5' 0" x 17' 10" x 9' 0"
Dining Room (Tray): 10' 4" x 13' 0" x 9' 0"
Great Room (Cathedral): 15' 8" x 19' 0" x 15' 2"
Kitchen : 10' 4" x 10' 2" x 9' 0"
Bonus Room : 18' 0" x 16' 0" x 8' 0"
Garage : 22' 4" x 24' 0" x 9' 2"
Master Bedroom (Tray): 13' 8" x 16' 0" x 9' 0"
Porch - Rear : 13' 0" x 10' 6" x 9' 0"
Porch - Front : 7' 11" x 9' 4" x 9' 11"